Just re-installed Ubuntu 14.04 (this time, the 64-bit version). I'd already set up my bluetooth speaker: see this post. 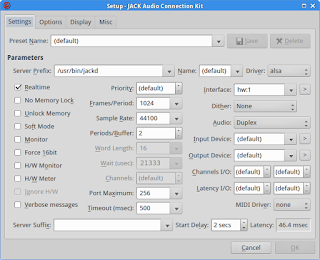 The next step was to setup JackD so that I could perform sound / midi editing. 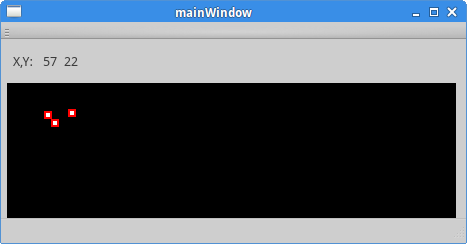 Now when I start QJackCtl, the JackD server launches automagically. All JackD applications communicate, and JackD is the process that allows this to happen. 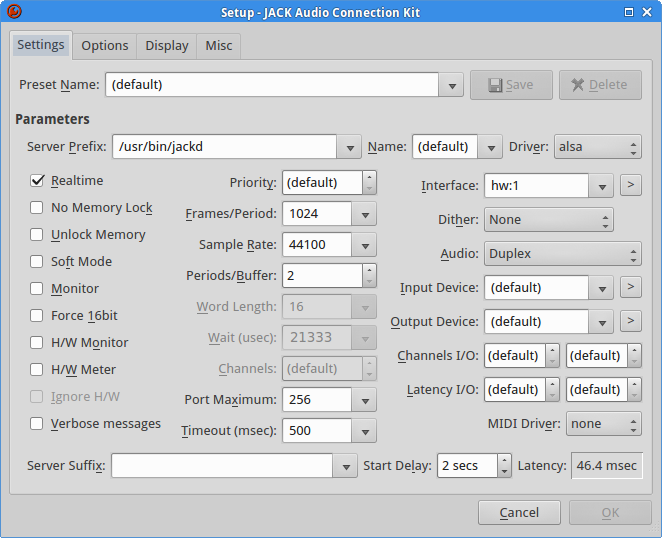 QJackControl is a front end to JackD, and allows you to manage what is connected to what. 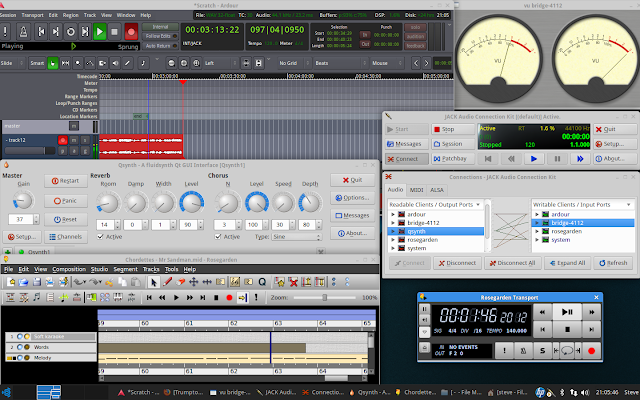 In this example, you can see that the audio synthesizer is connected to the system (speakers). 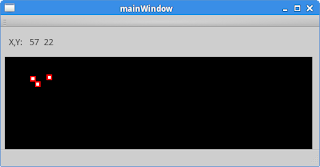 In this setup, rosegarden (the Midi player) is connected to the synthesizer on the Midi tab. So you can connect pretty much anything to anything. When you get going with multi-channel applications, you can route different channels in different directions - route some channels through sound effects processors, route some instruments out to external Midi hardware players, - almost everything is possible. 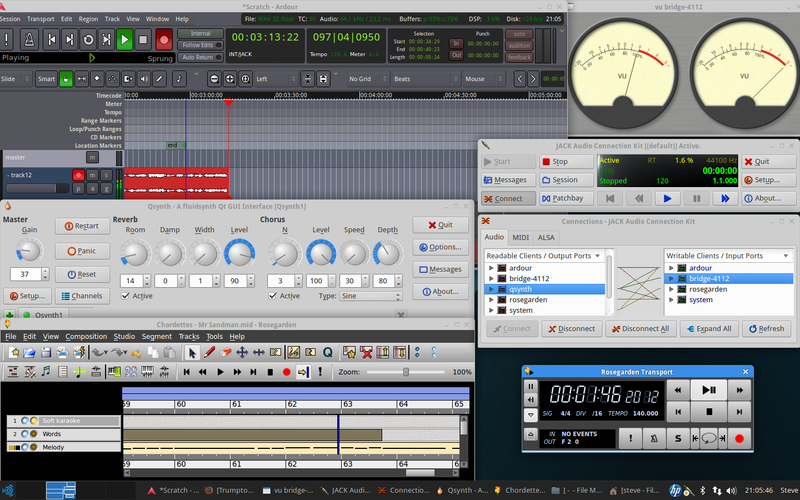 This is a screenshot of rosegarden outputting Midi to qsynth, which is passing its output to ardour, where it is being recorded, and also passing its output to the meterbridge, and to the speakers.